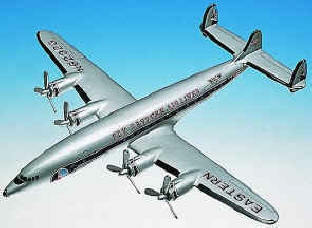 Many believe that the Lockheed L-1049 Super Constellation is the most beautiful airliner ever built. It had a sensuously curved fuselage and looked fast, exciting and beautiful. It was designed for Transcontinental and Western Airlines in 1939 as the Model 49 "Excalibur A" It was first flown in 1943 and almost immediately commandeered by the US Army Air Force. Designated the C-69, the huge Connie was faster than the Japanese "Zero" fighter. The army bought all Lockheed could produce. When the war ended, Lockheed bought back as many as it could and began converted them back to civilian airliners to help meet the great demands of the airlines for a long-range passenger plane. 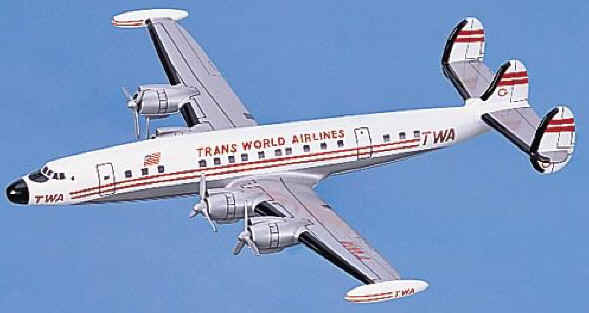 A total of sixteen civilian model designations were assigned, starting with the original model 49 and progressing in increments of 100 through model 1649 The 1049 Super Constellation was the first of the "Stretched Connies". It was 18� 4" (5.6 m) longer than previous basic models. The final Model 1649 "Starliner,"was delivered February 12, 1958. 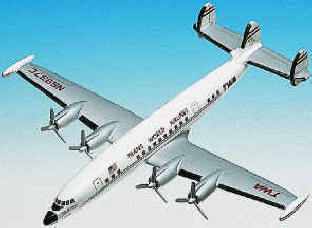 The "Connie" was always described in superlatives such as "highest", "fastest", "best" and "most". General Dwight Eisenhower used a C-121A military variant as his personal craft, named "Columbine" and another after he became President, named "Columbine II." Lockheed built a total of 856 Constellations; 331 of them for the military. Its fate was sealed by the new jet airliners, especially the Boeing 707, which could fly further, faster and for less cost per passenger. The Connie was the last of the great prop airliners. 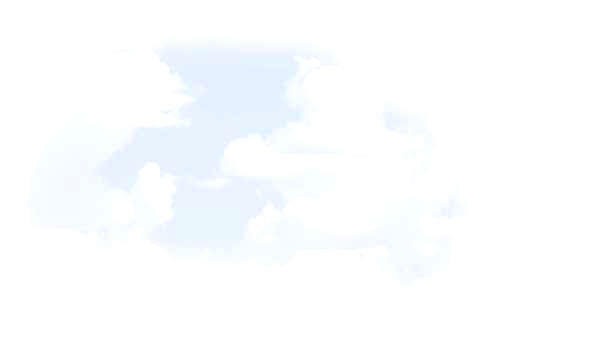 Many maintain that it was the best. Premier Series. 1/100th scale. 15" wingspan x 14" long. 15" wingspan x 13.5" long.